What we’ve learnt has been, honestly, very overwhelming for a business that went live just over a year back :). It was a validation that our text / captions approach to online video production is certainly making a small dent in the video universe! So, based on our learnings from our customer interviews and our business motive to be sustainable in the long run to serve our creators, we are introducing a new pricing plan from April 1st 2018. 1. Agency plan – There’s been a lot of agency interest in Typito of late, mostly social media agencies who want to resell videos created using Typito to their clients. We’ve introduced an agency plan exclusively for them. 2. Video rollover – We all know video marketing is getting big now. However, what we learnt from our users is that, at times, marketers find it hard to plan video making on a monthly basis. So we’ve introduced video rollovers. 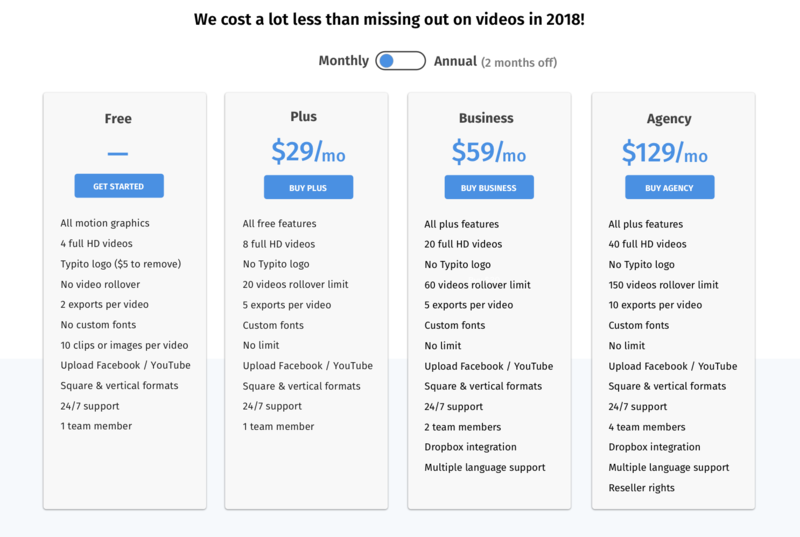 If you don’t end up finishing your video quota for the month, the excess videos will roll over to the next month upto a limit specified per plan. 2. Team members – We are introducing a collaborative experience on Typito where multiple team members can work together. We have been fortunate to have one of the most active early adopter community of subscribers supporting us. A lot of the improvements you find in the product are a result of the relentless feedback we get from our creators. As a small token of appreciation, we will be upgrading our existing paying users to have access to the new set of features for a year at the same price. ‘Growth’ plan users would have access to ‘Plus’ plan and ‘Professional’ plan users would have access to ‘Business’ plan with number of full HD videos per month remaining the same as they have now. Note – If you haven’t subscribed to a plan yet, this would be a great opportunity to do so and get access to premium Typito features at 50% of the cost. The offer is valid till March 31st 2018. Check out our pricing page to choose a plan. Square Videos on Facebook - Check!